Rachel Haroz, MD, of Addiction and Emergency Medicine at Cooper University Health Care and Burlington County Prosecutor Scott Coffina were just two of the speakers at this week’s Knock Out Opioid Abuse Town Hall panel at Rowan College at Burlington County in Mt. Laurel. The event was part of a series from Partnership for a Drug-Free New Jersey. Burlington County residents and other officials gathered at Rowan College at Burlington County in Mt. 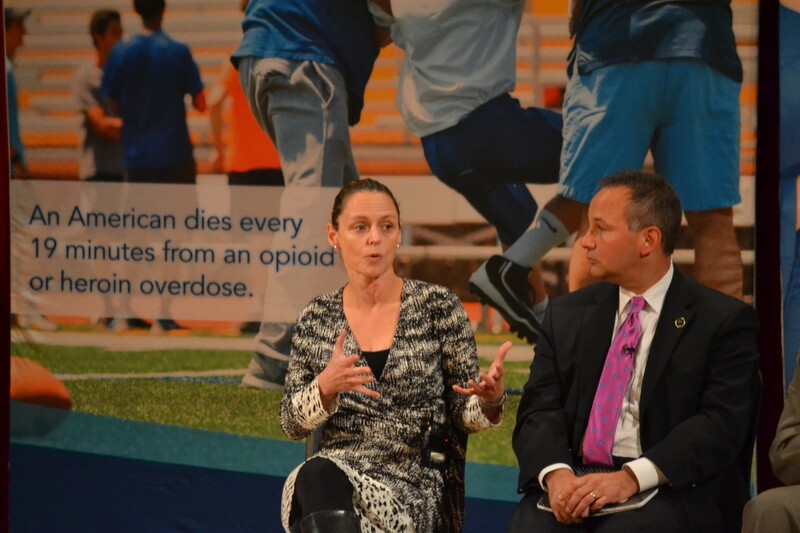 Laurel last week as part of the Partnership for a Drug-Free New Jersey’s latest stop in the statewide “Knock Out Opioid Abuse” town hall series. Organized with the Horizon Foundation for New Jersey, the event brought together Burlington County officials and medical experts to discuss what officials described as the opioid crisis gripping communities across the nation, including those within New Jersey. In Burlington County specifically, the number of fatal overdoses from heroin and other opioids rose from 57 in 2011 to 83 in 2016, according to the county prosecutor’s office. According to the U.S. Drug Enforcement Administration, that increase follows a national pattern, where everyday an average of 144 people in the United States die from an opioid overdose, with an estimated 2,000 people in New Jersey dying of an opioid overdose in 2016. Speakers at last week’s event included Assemblyman Troy Singleton, Burlington County Freeholder Linda Hughes, Burlington County Prosecutor Scott Coffina, Joseph Conlin, coalition coordinator for Prevention Plus of Burlington County, Rachel Haroz, MD, of Addiction and Emergency Medicine at Cooper University Health Care and Suzanne Harrison of King’s Crusade, which works to educate on opioid addition and help struggling families. Harrison, who co-founded King’s Crusade with her sister after losing her brother to a heroin-fentanyl overdose last year, spoke to the stigma that can surround the topic of drug and opioid abuse in families. “It starts within all of us, and it can change with each of us. Change your perception on addiction, and maybe the person who is addicted will also start to see differently and feel differently and see differently,” Harrison said. Throughout the town hall, officials spoke to the steps the county and state have taken to address the opioid crisis. Some steps were as simple as advocating for drug drop-off boxes in every community where residents can dispose of old, unwanted medication. Other steps include Burlington County officials working to reopen the 48-bed Post House drug treatment center in Pemberton that had closed earlier in the year over financial concerns. However, from a law enforcement perspective, Coffina said data suggests that Burlington County had yet to turn the corner on reducing the number of people addicted to opioids. In looking at the number of incidents where police or EMS in Burlington County deployed the opioid overdose reversal drug Narcan, Coffina said the number rose from 556 in 2015, to 653 in 2016 and already to about 700 in 2017. Coffina also said 30 of the county’s 40 municipalities have also already had at least one fatal, opioid overdose this year. With those statistics in mind, Coffina and his office have been taking a more vigorous approach to investigating overdose deaths and near overdose deaths to find, arrest and prosecute drug dealers. “It’s said many times that we cannot arrest our way out of this problem — but law enforcement must enforce the law and keep our communities safe,” Coffina said. The town hall was also preceded by a candlelight vigil to honor those who lost their lives to drug addiction and support those still fighting. Power commended officials and others for hosting the event and said he could not believe the difference that has occurred in how the public and officials treat the seriousness of the crisis of those addicted to opioids in just the time since he lost his son last year. “He just had the misfortune of being caught up in this whole thing, and I think much to do with this was the stigma associated with this disease,” Power said. To learn more about future events resources available for substance abuse treatment and prevention, visit knockoutopioidabuse.drugfreenj.org.